In 2003, the Musée Malraux received exceptional aid from the French government and the Région Haute-Normandie for the acquisition of an artwork by Gustave Courbet, The Wave, painted in Étretat in 1869. 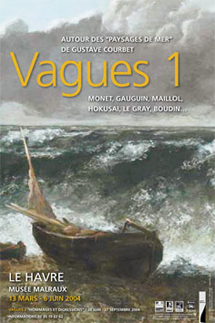 Using this key acquisition as a starting point, the museum decided to hold a major exhibition on the theme of the wave. The first instalment of the exhibition examines the issue of sources and the posterity of the works the master of Realism painted in Normandy, primarily between 1865 and 1869. In the mid-19th century, the sea—feared and misunderstood for a long time—suddenly became fashionable. The first coastal resorts were developed in Normandy and people took to bathing in the sea. Artists' portrayals of the sea changed too. The sea was no longer the theatre of naval history or dramatic shipwreck scenes, but rather a complex and fascinating source of study. For what could be more difficult than materializing the fluidity and transparency of water, seizing the unseizable: the ebb and flow, the endless motion of the wave? This was the new challenge facing the artists of 1850–1900. The theme fascinated Gustave Courbet and his friends Eugène Boudin and Claude Monet. Breaking with traditional marine art, he painted what he called "seascapes" in Normandy. With this series, a new chapter unfolded in the history of landscape paintings. The Impressionists then took up the torch, as Western artists discovered the art of the Japanese print and its great master, Hokusai. These "images of the floating world" influenced many painters such as Monet, who would become an avid collector of his prints, as well as Gauguin, Lacombe and Maillol. Their "waves" were then livelier and more colourful, with an undulating effect —what one would describe as a more Japanese style. Rapid technical progress in photography—another great discovery of the time—made the instantaneous capture of moments possible. A set of around twenty prints from the period composed of major works including Gustave Le Gray's The Great Wave provides an account of these new processes (from wet plates to the time-lapse photography of Albert Londe that ushered in the birth of motion pictures) and illustrates the fruitful ties between painting and photography in the second half of the century. Around one hundred works—paintings, drawings, prints and photographs—on loan from the world's finest museums sweep us up into the highly challenging world of the sea. While the artists each had their own sense of how to approach the subject, they all strove to go beyond its prowess and convey the serene permanence of the sea, the here-and-now and the forevermore.